Ransomware has evolved immensely over the past few years, with CryptoLocker being the ground breaking strain reaping huge profits for cybercriminals. According to a report in December 2013, the CryptoLocker malware authors collected 27 million USD worth of bitcoins from their victims over a period of 3 months. Looking at the success enjoyed by the CryptoLocker strain, it's not surprising that many new copy cat variants including CryptoWall emerged in the wild starting in late 2013. CryptoLocker suffered a major setback and the number of infections were reduced to nearly zero post Operation Tovar. This gave way to a worthy successor in CryptoWall, which has since evolved into one of the nastiest and most successful strains of Ransomware in the wild today. 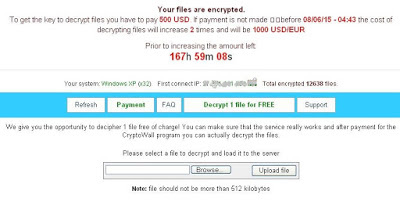 CryptoWall has been known to arrive via spammed e-mail attachments, exploit kits and drive-by downloads. 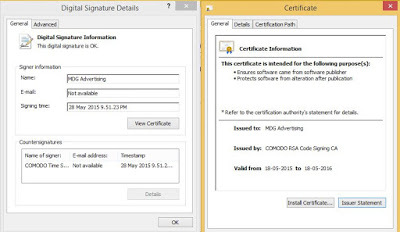 Recently, we started seeing a new campaign involving multiple signed CryptoWall 3.0 samples in our Cloud Sandboxes being downloaded from a popular file hosting service, MediaFire. It also deletes the original copy of itself. The RC4 key is generated by doing a simple alpha-numeric sort on a string stored inside the binary as seen in the screenshot below. The unsorted RC4 key is also sent as part of the POST request. 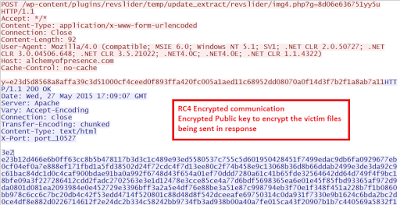 Upon successful encryption of the files on the victim machine using the public key, it reports back the number of files that were encrypted to the C&C server. The information collected by the C&C server is leveraged to present a more personalized decryption instruction page that includes user's operating system, public IP address, and the number of files encrypted as seen below. The ransom amount requested in our case was $500 USD and to prove authenticity, the malware authors also offer the victim a "Decrypt 1 file for FREE" option, which is limited to a 512 kilobyte file. You can get full list of the Compromised WordPress sites that we have oberved in past one week here. CryptoWall remains a potent threat to enterprises and individual users alike. Traditional AntiVirus applications continue to struggle against this nasty strain of ransomware, as once the infection is successful, there is very little AV vendors can do, even by adding signatures reactively. A hybrid and multi-layered security approach is required to counter this threat. Taking regular backup remains the most effective counter measure against ransomware.